When Animals Attack, Some Respond With Compassion : 13.7: Cosmos And Culture Would compassion be your first response if you survived a shark or bear attack? Anthropologist Barbara J. King hopes her answer would be "yes." Last month, Australian surfer Jade Fitzpatrick sustained three bite wounds to his thigh from a great white shark as he waited for a wave on his surfboard off the north coast of New South Wales. As the Guardian newspaper reported, he was helped out of the water by a friend, received medical treatment and planned to surf again in the same waters within 10 days. What struck me about this report was Fitzpatrick's calm and compassionate attitude about the whole event. He said he doesn't favor a proposal to install shark nets in the area to protect human swimmers and surfers, because other marine life could be negatively impacted by the nets. He holds no grudge against the shark. 'I am just doing what I love and he is just being what he is.'" I love that sensibility: Yes, the shark was just being who he is. I've thought about human-wildlife encounters a lot because, over the years, I've spent time out walking in places like Amboseli National Park in Kenya and U.S. national parks like Yellowstone and Shenandoah. If I were ever caught by surprise and survived an attack by a wild animal, I hope I'd use Fitzgerald's calm compassion as a model. Or that of Karen Williams, a trauma nurse and ultra runner who sustained more serious injuries including a fractured eye socket and multiple punctures from a black bear while running a marathon this past June in New Mexico. 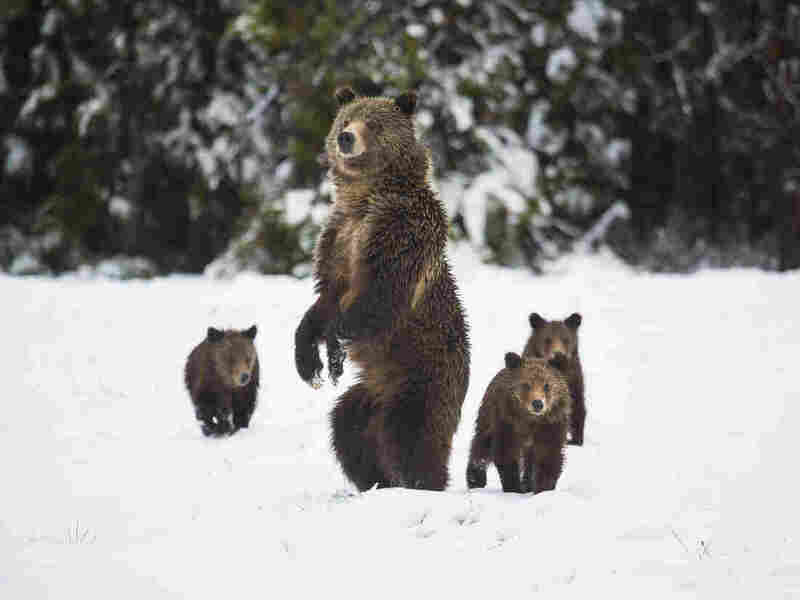 The bear was a mom with three cubs, and Williams surprised her as she ran. A New Mexico state law requires killing any wild animal who has attacked a human, then testing that animal for rabies; the bear was killed the day after Williams was injured. Williams told the New Mexican newspaper in June that she would push for overturning that law. For one thing, no bear so tested in New Mexico has in more than two decades been found to have had rabies. "...said it was wrong for the state to kill a bear that acted on its protective instinct. Williams and many others around the country said the bear was defending its two cubs in a wilderness area, not stalking her." Or, to put it another way, the bear was just being who she is. Thinking out of the box in these bear situations doesn't seem insurmountably difficult. To quote once more from the New Mexican: "Many states on the East Coast allow wildlife officers to consider the circumstances that led to an attack when deciding whether a bear should live or die." As always, it is our responsibility to be as prepared as humanly possible when we enter wildlife areas. If we use common sense and take precautions we may save animals' lives, as well as our own. Last month in Yellowstone National Park, John and Lisa Vandenbos were fishing along the Lamar River when they surprised an adult grizzly bear. Just as with Fitzgerald and the shark in the ocean, and Williams and the mother bear along the marathon route, very suddenly an encounter was underway that was no one's fault. This bear, who had been feeding on a carcass, didn't take kindly to the unintended intrusion — and immediately charged the Vandenbos. According to a press release from Yellowstone, the couple did everything right. The bear "came within nine feet when both individuals quickly discharged their bear spray." "The bear initially left. When attempting to charge the couple again, it ran into the original cloud of bear spray. Upon making contact with the cloud, the bear retreated all the way back across the river and up the adjacent hillside 'as fast as it could go.' The couple did not sustain injuries." And there's more good news from Yellowstone, according to the press release: "Park rangers do not intend to search for the bear since this incident was a surprise encounter with a bear defending its carcass."